We have come to decide that Normandy is not as motorhome friendly as it first seemed (unless that motorhome is based on a Ford Fiesta!). Everywhere we tried to get at, had either, a 2.0m height restriction, or a 3.5 tonne weight restriction, or both. Did this stop us naaa. On one occasion whilst trying to get to a nice looking spot on the coast in Granville, we drove down a very very steep and winding narrow road (that was also quite busy), only to get to the bottom to find the dreaded 2.0m height restriction. What followed resulted in virtual carnage as I performed a near perfect 38 point turn in the narrow road! After leaving Deauville, we followed the coast road west through to Cabourg, then cut inland to Granville. 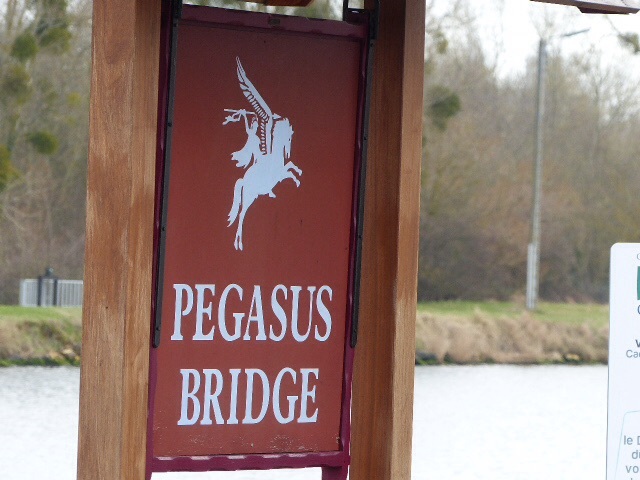 Enroute we decided to visit Pegasus Bridge and Memorial Museum there. As I’m sure you are aware this was the scene of a bloody battle on the day of the D Day landings, which saw British soldiers crash landed in gliders next to the German held bridge. 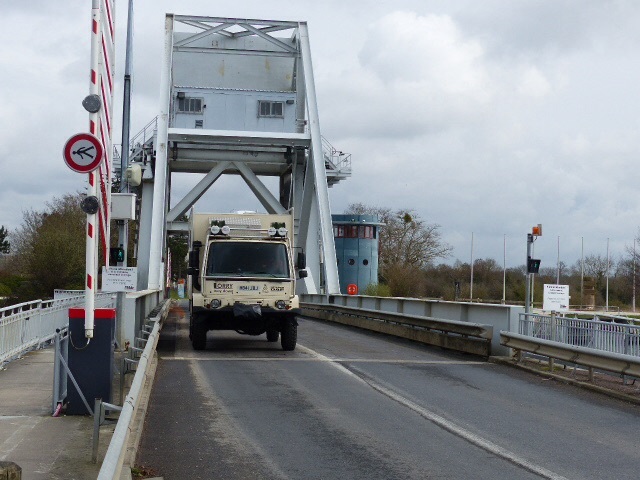 Their brief was to take the bridge without the Germans having time to blow it up, and then hold it until the landings had pushing inland that far. Obviously they succeeded but with very heavy losses. The Museum is an amazing place, with exhibits both inside and out, including a full size replica glider, heavy weapons, and the original bridge (currently being refurbished). Well worth a visit. After we left the Museum, we met a large group of ex British soldiers, that had received various wounds whilst serving in Afghanistan, they were on a tour of various D Day sites, and were cycling parts of the trip, very humbling. Obviously Jac’s had to take a photo of Colonel K crossing the Bridge. We’ve had a couple of free camps, one in a carpark in Jullouville, and last night in a Swimming Pool Carpark in Les Essarts (Southof Cholet), awwwww the glamour of travelling! To be honest, when we’re moving from one place to the next each day, theres little point of staying on a campsite. Anyway, virtually all the campsites in France are closed at the moment as its still pretty cold at night. We are now down near Limoges, and have decided to stop on a lovely little site (max 6 campers), run by an English couple, Neil and Nicky. We are the only ones here, and its in a beautiful area near the village of Les Salles Lavauguyon, which is in the Perigord Limousine National Park. The idea is to stop at Camping Chez Rambaud for 3 nights giving us time to explore the area on our bikes and do some walking. The cost is approx £12.00 per night for the 2 of us and the Colonel. We just hope the weather improves. After this, we will be heading down to the Midi-Pyrenees, to see our old friends from Hastingleigh, Jamie and Emma, and their 2 children. We are looking forward to emptying our Truck Cellar with them. 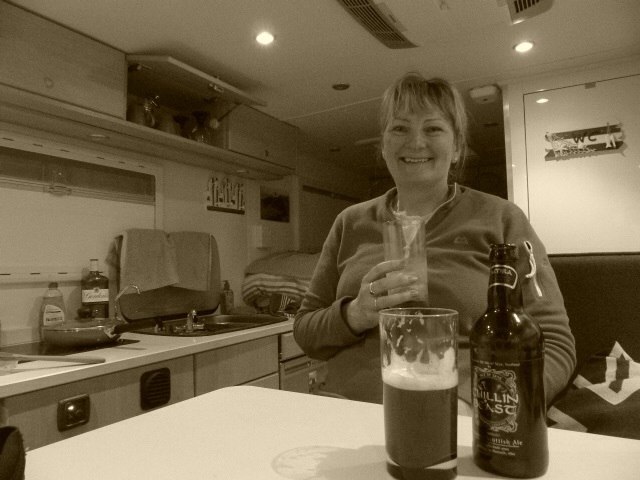 Both the Daf, and Jac’s seem to be suffering from the same issue……….. thirst! Diesel for Colonel K, and Gin and wine for Jac’s! Good Luck you don’t know me but im with you all the way have a great time. Back on the road again…….. but first a quick update.